Istanbul’s Taksim Square has been the scene of mass protests against the policies of Turkish Prime Minister Erdogan since early this summer. Alexei Shichkov — a left-wing activist who visited Istanbul, took part in the events and posted about them on Facebook — shares his experience in Turkey with RBTH. I had been following the developments in Turkey since the very beginning: I read press reports and subscribed to all Facebook groups on the Gezi Park and Taksim. It turned out that there was a very strong trade union and left-wing movement there. Those folks rally for ideals that I share. At home, our liberals are, so to say, in favor of everything that is good and against everything that is bad. In Turkey, on the other hand, people have very specific demands. And, of course, I recalled the history of the international brigades in the Spanish Civil War. This is a very strong motivation: internationalism and a desire to support people who share your ideas. I met Germans in Istanbul who said they simply had to come. I had never been to Turkey before, but everything turned out to be easy. I found the cheapest airline tickets, packed my camera and sleeping bag, and off I went. I slept in the street; at one point, café owners took us inside during a tear gas attack. On my first day, I simply checked into the camp. I went there and asked: “Can I sleep somewhere here?” And they said, “Of course.” They brought pillows and a rug. When people learned I was from Russia, they got all excited. There was only one who asked, “What are you doing here? Go home.” I explained to him that it was my way to spend a vacation. People do all sorts of things on holiday, and that is what I do. But this only happened once. Everybody realized that the local media was silent and a blogger from Russia would be a good thing. It meant that the information blockade could be breached. There were Russian journalists there, but only a few — from Novaya Gazeta, from Kommersant. I saw “Free Taksim!” graffiti in Russian on one of the streets. I have no idea who painted it. You must be very careful taking pictures there. In Russia, people like to be photographed with barricades or riot police in the background — then those photos can be used as evidence to send people to jail. The Turks were very clear about that: “Foto yok” (“No photos”). And they covered their faces with scarves. Opinion: Hot Turkish Summer: Is the Arab Spring spreading? 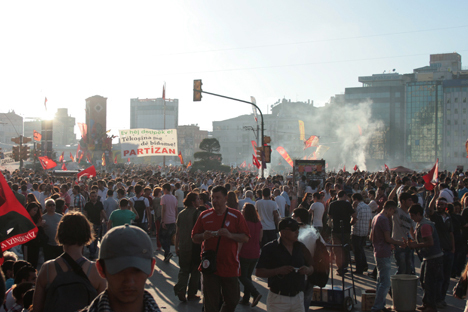 Around 200,000 people gathered on Taksim. Even though people from the Asian part of the city were barred from reaching the square, they tried to cross the bridge — but helicopters dumped gas canisters on them. There were people from all walks of life: Islamists, anti-Fascists, Marxists. There was no stealing, no drunkenness. And it was surprisingly well-organized. People were saying: “Tonight it’s me who spends the night in the camp, tomorrow it’s my wife, and then my dad.” They shared stuff and brought food and money to the square. Once, we went for a walk toward a police station, and the cops just started regrouping. I turned on my camera and began shooting from knee level, so the camera was sort of hidden. Then I viewed the recording, and it turned out I had filmed the cops kick the heck out of someone. They started pressing us. We said we were Russian journalists, and they said, “Erase the recording.” I tried to play the fool and pretend I didn’t know how to erase it. In the end, they erased it themselves, of course, and they told us to scram. But it got really scary when they threw grenades at us. There were three wholesale gas attacks. I received a big dose, because I was sitting near the door, while the café owner and waiters managed to flee into the toilets. I didn’t know back then what pepper gas was like. Pepper is very strong there. Inhale it mixed with smoke and you just can’t stop coughing; your throat aches so badly that you want to be sick. During the lulls, glamorous girls between the ages of 19 and 25 were taking pictures of themselves in masks and helmets. Then they posted them on Instagram. And when all hell was breaking loose, the same girls were helping the wounded. They sprayed diluted milk mixed with lemon juice in the faces of those who had been burned by gas. Just ordinary girls — the kind that wear short skirts and paint their nails. I saw the cops beat up girls in Izmir just for wearing helmets. This is not my revolution. I didn’t go there to take part in riots. I knew full well what I could do to help: tweet, post on Facebook in order to spread awareness. Interestingly, the Turks were reading me too; there was a lack of information at the time. Their main slogan is: “Taksim is everywhere; resistance is everywhere.” Everywhere indeed — 74 cities are already taking part in the protests. The protest has spread along the margins of the Anatolian Peninsula, to cities that are exposed to other civilizations. They are more civilized and they understand the situation better. It is all over now. Taksim has been cleared. And yet everything is still going on. They still come to Gezi every weekend, gather in parks and discuss what comes next. Left-wing activists are being searched, and it is clear that the next step will be a ban on their organizations. Elections are scheduled only for 2015, but the Turks will be rallying in the squares preventively — they understand that fascism is just around the corner.